The Indian Pharma industry is experiencing unprecedented growth and is among the top 6 markets in the world. The Government of India has taken several steps to bring Pharma to the forefront by 2020 including increasing expenses in R&D. However, the industry is beginning to saturate and is in gross need of latest technologies. Plenty of providers are coming up with such solutions. 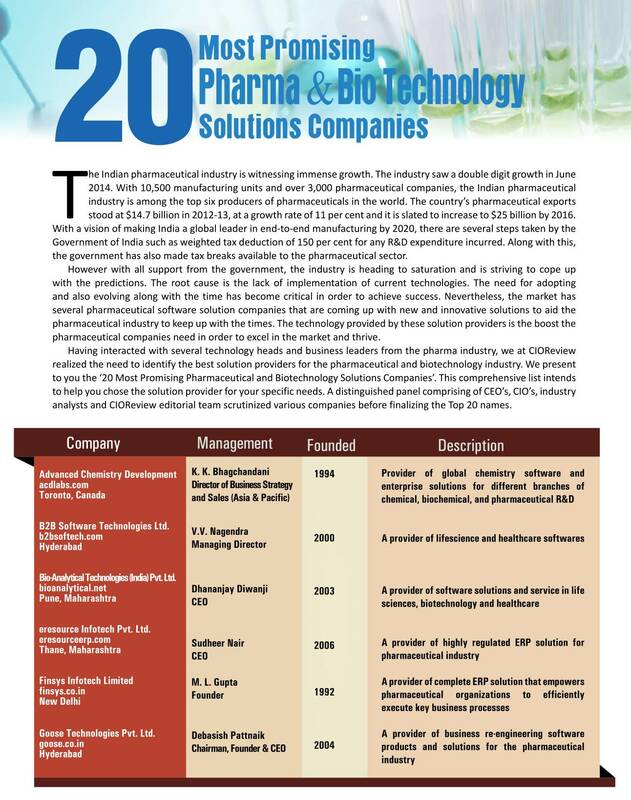 CIO Review, a premier business magazine has listed the top 20 Most Promising Pharma & Biotech Solutions Companies in India, which can drive it forward and Quad One Technologies is among them. Started in Hyderabad in the year 2000, Quad One Technologies has produced numerous solutions for the Pharmaceutical industry. Some of their products were the first of its kind in the market. The company’s expertise in this field allows it to develop proprietary software like Clinical Trials systems, Expense Tracking systems, Closed Loop Marketing solutions, Mobile Applications, CRM and Sales Reporting solutions. In order to rise above competition, one needs deep domain specific expertise. Such is provided by Quad One. Their software Clinion focuses on basic research. It greatly reduces time-to-market for Pharma and provides the tools necessary for clinical trials, thereby simplifying the process. Their CLM (Closed Loop Marketing tool) is designed exclusively for conducting surveys and result collation for Pharma companies. Apart from these, they also provide Sales Dashboard – a web-based tool, which provides graphical information about brand behavior and market behavior. While most of the Pharma market still uses Excel sheets with manual calculations and are tedious in nature, their tools provide all this on the go without the associated hassles. Quad One had humble beginnings in Hyderabad and started off developing solutions for the healthcare sector. They first implemented a HIS (Hospital Information System) which was deployed across hospitals in Andhra Pradesh. Once this took off, they went full throttle and started developing their own products. Manuj adds, “Today we are a products and services company that has worked with some of the largest companies in India in Pharmaceuticals, Biotechnology and Allied services.” With prominent clients like Dr. Reddy’s, Bharat Biotech, etc. the company is also contemplating expansion in South East Asia and the Middle East. Manuj looks at the future and realizes the importance of mobile solutions. 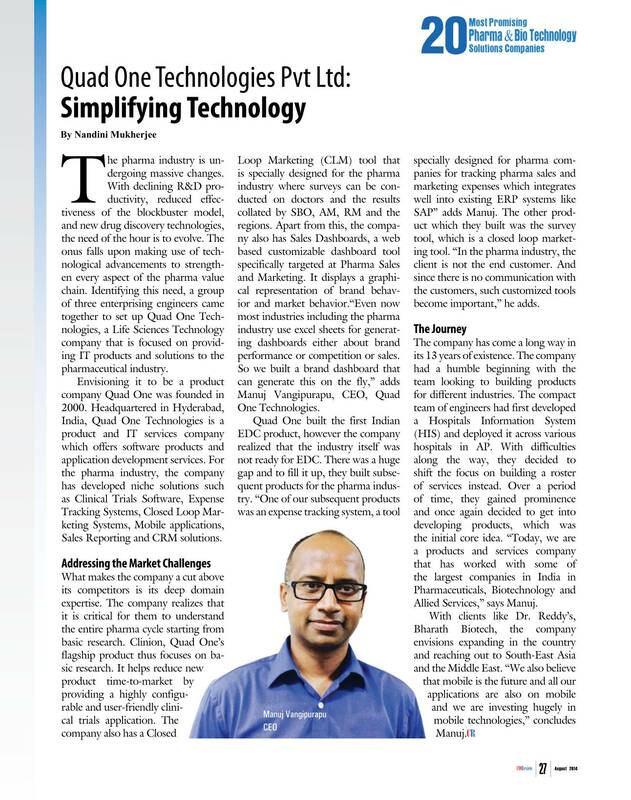 “We also believe that mobile is the future and all our applications are on mobile and we are also investing hugely in mobile technologies.” The future surely looks bright for Quad One Technologies.